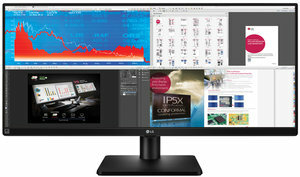 Features a 34" ultra-wide, flat-panel display with 21:9 aspect ratio. 5,000,000:1 dynamic contrast ratio enables amazingly accurate color reproduction. 2560 x 1080 maximum resolution for a high level of picture detail and a clear, bold display. 15" x 32.7" x 1.9"
Efficiently run several programs and have multiple active windows on the screen at the same time. How to Install & Use the 4-Screen Split Feature 1. Install the 4-screen split software from the CD included in the package. 2. Locate the 4-Screen Split icon located on the task bar. 3. Select the Screen Split layout desired. 32.7" x 9.9" x 17.2"
32.7" x 1.9" x 15.0"